This is one of my favorite series currently being written. A long time Sherlock Holmes fan, I always keep an eye out for fictional characters operating against the same historical backdrop of Victorian England. Thomas’ first novel in this series, SOME DANGER INVOLVED, hooked me immediately with the introduction of Inquiry Agent Cyrus Barker and his just-recruited aide, and chronicler, young Thomas Llewelyn. Dig into these archives and you’ll find my review of that terrific debut adventure. Thomas wasted no time enjoying his laurels and soon offered up books two and three; TO KINGDOM COME and THE LIMEHOUSE TEXT, respectively. Each continued to evolve the relationship between the two main characters and delved deeper into the social and economic world that was the British Empire at this juncture in history. With each new entry we’ve come to learn more and more about Barker’s past in the Orient and his life as a ship’s captain. Whereas Llewelyn begins to mature under his employer’s tutelage, gaining new found confidence along with the skills imparted to him to become a bona fide agent. When a young girl is kidnapped in broad daylight outside the offices of a respectable charity, Barker and Llewelyn are hired by the girl’s father who fears she’s been taken by white slavers. Against the backdrop of child labor issues and the plight of the poor in London’s factories, the two men soon uncover a much more sinister evil at work. The girl has become the victim of an audacious child serial killer who openly taunts the police with poems insulting their attempts to capture him. Calling himself Mr.Miacca, a character from a children’s fairy tale, this heartless killer promises to continue murdering little girls unless Barker can discover his identity and put an end to his twisted crimes. The Barker and Llewelyn mysteries are suspense page turners that will satisfy the most jaded crime reader. I have relished each new adventure as they continue to round out these complex men and the world they inhabit. 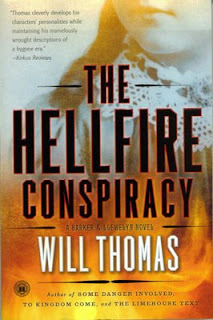 THE HELLFIRE CONSPIRACY is a pure literary triumphant and readers would be hard pressed to find a better classic mystery series. Books such as this one are why I love to read. Need I say more? Just a little over two years ago, writer-publisher, Charles Ardai, and an associate, burst on to the pulp scene with their noir imprint, Hard Case Crime. Since then they’ve given pulp fans over fifty of the finest pulp noir mysteries, crime and thrillers from both new works and reprints of long forgotten classics. Both the company and several of its books have justifiably won awards. Of course, once saturated into the world of pulp fiction, it was only a matter of time before Ardai would turn his creative attention to the most popular genre of that field, the hero pulps. Thus he’s created a second imprint, Leisure Books, solely for the purpose of giving us the exploits of a modern day, globe-trotting pulp action hero; Gabriel Hunt. With his roots firmly in the past ala classic 30s pulp heroes, while brandishing today’s modern technology, Hunt joins his contemporaries Dirk Pitt, Kurt Austin, Jack Reacher and Special Agent Pendergast, among others, as a terrific new two-fisted star. In this first adventure, an old Confederate flag may be the clue that unlocks the mystery of one of the world’s oldest legends. From the swamps of Georgia to the jungles of Guatemala and a lost Mayan city, Hunt and a beautiful Mexican scientist pursue an ancient mystery with death hounding their every step. Bestselling novelist James Reasoner is the imagination behind this debut outing and he delivers it all, fast pacing, exotic locales, damsels in distress and a classic pulp quest. Other well known writers will be assuming the by-line in subsequent installments. 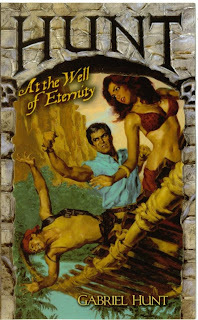 This is a dynamite new series and AT THE WELL OF ETERNITY a grand debut send off. Clearly, the “Hunt” for adventure has begun! CORRECTION ADD ON - I mistakenkly thought Charles Ardai had started Leisure Books. Erin Galloway, Manager of Marketing was kind enough to correct me. "Established in 1972, Leisure Books is an imprint of Dorchester Publishing, the oldest independent mass market publisher. We worked with Charles to create the Hunt series." My apologies and thanks for setting the record straight here. The old adage says you can’t judge a book by its cover. That’s true, unfortunately what that saying fails to take into account is, you can’t market a book without a hell of a nice cover. It’s not that readers judge a book by its packaging as much as attractive covers are more likely to attract attention. Which is why C.J. 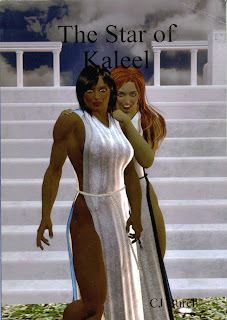 Burch’s self published adventure, THE STAR OF KALEEL, gets a very bad deal here. Had Burch been able to acquire the services of people who know art and graphic designing, I am positive his work would be getting a wider audience. THE STAR OF KALEEL is a sword and sorcery tale that is competently written, presents fresh ideas and settings and offers up two really great characters at its center. Karim and Maleeva are vicious, professional gladiators in the pits of Solon, where they fight and die for the entertainment of the populace. Karim is the older, wiser of the two, whereas the younger Maleeva desires to take her place as the number one fighter in the pits. Both are soul weary of their lives and when they are offered a job as agents of a wealthy female politician, they see it as their one chance to escape their hellish lives. The plot is simple enough and a familiar one to readers of this genre. Somewhere in a desert outpost between the east and the west, a power jewel is buried, hidden away hundreds of years ago because of its dangerous powers. The Star of Kaleel is said to be able to destroy entire nations, maybe all mankind, with a simple thought. Now a madman named Hafad is after the jewel for his own dark ambition and Karim and Maleeva are sent to stop him and steal back the jewel for their patron. Burch moves the pace along at a good clip and the writing never gets bogged down. The characters are fully sketched and as a reader I found myself quickly caught up in their circumstances. Most readers expect to find male heroes in this kind of adventure, thus having two beautiful, deadly women instead is a refreshing change. Burch explores the women’s lives and feelings towards each other in a very delicate and mature fashion, eschewing a prurient approach a lesser writer could easily have been tempted to follow. Thus, in the end, he delivers a solid, enjoyable adventure that I’m very happy to have discovered. This is a very good book that deserves your attention and support. Go to Lulu.com and punch it up. And please, as I said at the start of this review, don’t be put off by the cover. Yes, it is crude and amateurish, but what’s inside is anything but. The last time we saw Special FBI Agent, Pendergast, he had survived a deadly encounter with his brother, Diogenes, who died in that contest. All of that took place after Diogenes has violated his beautiful young ward, Constance Greene. In an attempt to heal her scarred psyche, Pendergast takes her to an ancient Buddhist monastery hidden deep in the mountains of Tibet. 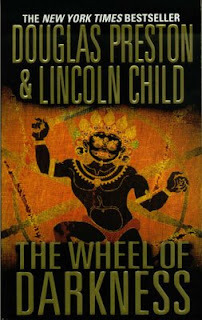 It is there that they learn that a very rare and powerful occult object has been stolen from the monks and Pendergast is asked to retrieve it. He is told that this strange thing, called Agozyen, is capable of unleashing a great evil upon the world. One that could have catastrophic results for all mankind. Pendergast and Constance take up the hunt, trailing the thief to England only to find him horribly murdered and the Agozyen gone; this time into the hands of a killer. The trail leads to the docks and the launching of a new, super ocean liner called the Britannia, about to depart on its maiden voyage to New York City. The magnificent, ultra modern ship carries with it over three thousand guests and crew. And a fiendish, arcane monster that quickly makes its presence known with a series of gruesome, random murders. Thus, while Pendergast and Constance continue to search for the identity of their unknown prey, the crew of the Britannia finds itself dealing with ship-wide panic and paranoia as their wealthy guests soon realize their leisurely cruise has become a nightmarish voyage to destruction. When Pendergast is mentally attacked and then subjugated by the Agozyen, it falls to Constance to somehow save him, if she can, before all is lost. Since his first appearance in the team’s book, RELIC, Special Agent Pendergast has rapidly evolved into one of fiction’s most unique and appealing action heroes. I’ve always maintained that there is a modern version of most of the classic 1930s pulp heroes. We’ve all known from his debut novel that Clive Cussler’s Dirk Pitt was our new Doc Savage and all his subsequent adventures have born that out. I’d like to suggest that Pendergast is our new Shadow. He’s as original and mysterious a crimefighter whose greatest asset is his brilliant mind and encyclopedic knowledge of everything under the sun. I think the late Shadow scribe, Walter Gibson, would have been a huge fan of these books. They are pure pulp heaven.